I've been thinking about a sort of Krampus theme deck. My first thought wasn't Swamp King, or Sedris, or any demon for that matter. 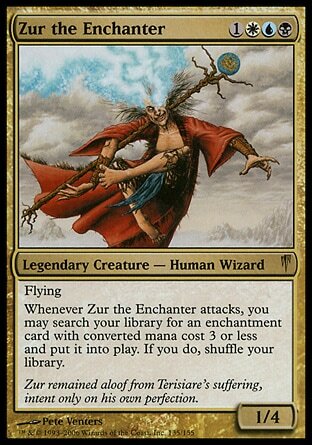 Actually, my first thought was Zur the Enchanter. My argument is this: zombies. Yea, zombies. There's a strong number of small enchantments which deal with zombies (Corpseweft, Curse of Shallow Graves, Necromancer's Stockpile to name a few) and can be searched up with Zur. Zombies make a great antithesis to Santa's helper elves. Including these and other zombie cards will not only create the flavor of the deck I'm looking for, but also help limit the abuse Zur is capable of dealing. After thinking about it further, the removal suite for this deck also works towards the Krampus flavor. From what I can tell from some of the light reading I've done on the subject, Krampus is known for stealing the nasty little boys and girls who misbehave. Cards like Oblivion Ring, Journey to Nowhere, and etc.--that is, exile effects on small enchantments--is a way of representing this kidnapping aspect. Furthermore, I appreciate the fact Zur is from Coldsnap, allowing me to include some snow cards like Cover of Winter, Glacial Plating (I know this can't be searched up with Zur), and a few others. A full set of snow lands can help portray the Christmas time feel. Finally, Zur's art is quite evil Santa-esque: red coat, demented expression, flying through the air, and carrying a staff (which is something St. Nicolas is sometimes seen carrying). My conclusion is that Zur seems an appropriate card to represent Krampus (although I will concede in more of an evil Santa way rather than the demonic Krampus...I'm just loathe to call the deck "Bad Santa" since I don't want the connection to the movie Bad Santa). The only concern I have is over power level. Zur isn't a general I've ever piloted before, so while I'll hopefully get some kudos for the Krampus-evil-Santa-Christmas-snow theme I'd rather not ruin games by either being too weak or too strong. Any opinions or advice? So apparently it's a thing Krampus does, but it makes the exile-effect enchantments have some meaning in the deck. These are where a lot of Zur's power resides (the other being pump cards), so I'll probably keep the number of these cards I to a minimum. Crawlspace--ever tried to climb up a chimney? Reparations--"Sorry my zombies stole your children, now give me some gold." This is the other section of the deck I'll likely keep mostly to a minimum, or use cards which more aim towards granting all of my creatures P/T increases. This will help keep Zur in check. Also, there's a few cards which are just good targets for Zur. I've played this deck a few times now, and while it is a little powerful at times I think I'm really close to tuning it just right. I also have managed to fit in a ton of really good zombie cards in here. Necromancer's Covenant and Necromancer's Stockpile would probably be good. A couple of other possibilities for zombie cards are Lord of the Undead and Risen Executioner. I don't want to stray too far away from the evil Santa theme though.